Purchased with the assistance of the Friends of the Ashmolean, and Mr and Mrs J. Hillier, 1973. 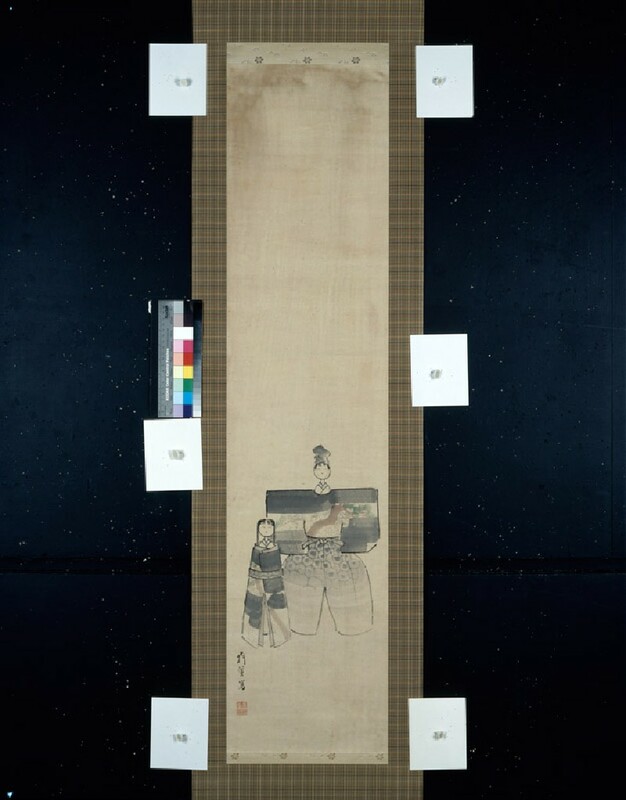 During the Edo period, images like this were probably hung to adorn the home at the time of the Hinamatsuri, Doll or Girl’s Day festival, on 3 March. This type of doll first appeared in the fifteenth century, and in the sixteenth century was a children’s toy, as deduced from portraits [this type of doll can be seen in a portrait of Maeda Toshiie’s daughter, Kikuhime, done in 1584. See Shigeki Kawakami, ‘Ningyō: An historical approach’, in Ningyō: The Art of the Human Figurine: Traditional Japanese Display Dolls from the Ayervais Collection: With Additional Pieces from the Peabody Essex Museum, Salem, Massachusetts, the Network Museum, and the Museum of the City of New York (New York: Japan Society, 1995), 14]. Tachibina, or standing dolls made of either paper or clay are always in pairs. The male doll’s arms are outstretched and the female doll has a very simple cylindrical-shaped body wearing a kimono tied with a sash, or obi. Perhaps paintings were preferred to the actual dolls though, since the dolls could rarely stand up without support and were easily knocked over. Pairs of these dolls are found as a design on lacquerware, porcelain and netsuke carvings, as well as painted hanging scrolls. Their kimono display a range of motifs including wisteria and irises, but the pine tree, as seen here, seems to be the most popular when this couple is painted. Here, the couple are the only image on an otherwise blank background. They are dressed like Heian period courtiers: he has on hakama trousers and a courtier's cap and they both have distinctive high-placed eyebrows that courtiers would apply with makeup. The artist delights in the simple geometric forms of the round heads and cylindrical bodies. Despite such clear contours, the image is not a stiff one. In fact, both figures are imbued with a very cheerful and relaxed human sense due to their smiling expressions. Gitō was Goshun's pupil. He was born in Bizen (present-day Okayama prefecture) where his father was in the shipping business. After moving to Kyoto, he occupied a studio off Shijō, and came to be known as a painter who excelled in figural images, rarely copying his master’s works or using models. He was proficient in many subjects, but is particularly known for his Chinese figures and Ukiyo-e beauties [for examples, see Minamoto and Sasaki, 95-100, 206-7].